It's not all bad news this evening as the fund has exceeded £1000!!! An application will be made to the Northern Rock Foundation to have this matched. Hopefully, that will mean that over £2000 will be on it's way to The Children's Foundation. Thanks go to all sponsors for their pledges and in particular Jimmy Bell who, today, made a very generous donation indeed. It looks like this unforgiving 22 mile route has claimed it's second victim in as many years! News from Steven Moore's medical team is not good! "Torn cruciate, torn meniscus and subluxation of the kneecap" was the verdict on Steven's well being! More news tomorrow as I get it. What did you make of that Alan? This year's Pennine Challenge was not just a tale of ordinary people doing extraordinary things in extremely difficult conditions all for a local good cause and against all the odds. What I was honoured to be part of was so much more than that. You just had to be part of it to appreciate the amazing journey that this merry band of runners and cyclists made over 2 days. I make no apologies for sounding sensational and over the top. Absolutely no way! For what I witnessed over 2 days deserves this kind of banter. While we're on, let's chuck a few more superlatives in there and so deservedly get away with it. Let's say, for instance, if Alan Hansen were to give his opinions about the gruelling challenge on Match of The Day he would throw about words such as "Courage", "Heart", "Power", "Pace", "Resilience", "Strength" and "Dedication". It would be at this point that Alan Shearer would quip at "How the lads never gave in" and "deserved every accolade". That wily old Scot, Hansen, would retort by saying how well organised we were at the back, how good our engine was in midfield and how lethal we were up front. That would just about sum up the 2008 Pennine Challenge Team of Michael Dunn, Ian Glasgow, Jim Patterson, Steven Moore, Jonathan Dixon, Mark Cass, Carlton Fletcher and yours truly, Mark Allison. Like any good team, we dug in when we had to! And when we dug in, we did it together as one unit. For the most part, we never underestimated the opposition. For you underestimate this particular route in the North Pennines at your absolute peril. Sure enough, we had our low points. We had our injuries and setbacks. The team that was ultimately put out there to get a result didn't resemble the one in the lead up to the big weekend. For one reason or another the team chopped and changed. But the team just went out there, played to a game plan and got the required result. We played a blinder really! Of course, I should mention that every good team needs good support. And boy did we have good support. They were there just when we needed them, almost every step of the way. They fetched, carried, cheered, fed, watered, encouraged and provided for our every need. The support team were our ultimate reassurance. We knew that in difficult times they were just around the corner. 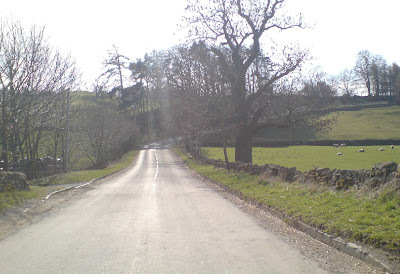 (albeit that the corner was sometimes at the top of a steep hill!). We knew that we would be able to go out there and perform at our highest levels, safe in the knowledge that they would back us all the way, no questions asked! Ladies and Gentlemen, I pay tribute to the roadside supporters - Mandy Baker, Katy Allison and the legend that is John Brettell. Although, as legendary as John is, he can't work a camera all that well! Which is why the shots came out in black and white! And you thought we were just being artistic!! 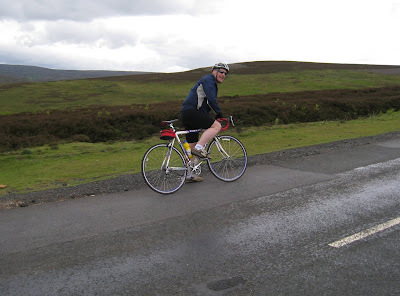 Tune in soon for the remainder of the Pennine Challenge 2008 review! 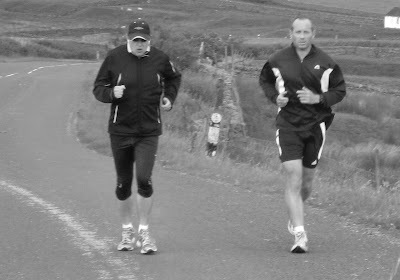 Carlton Fletcher and Mark Cass reach the finish line in Middleton-in-Teesdale. 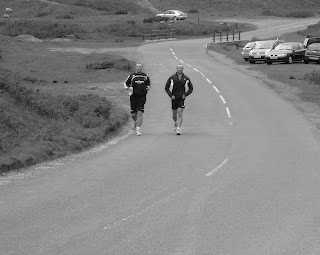 Carlton Fletcher and Mark Cass at the 19 mile point. Steven Moore and Jonathan Dixon reach the 19 mile point. 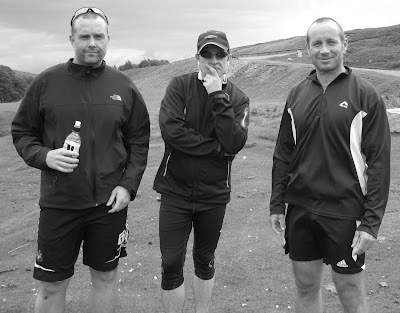 Me (Mark Allison), Carlton Fletcher and Mark Cass at the 13 mile point. Steven Moore and Jonathan Dixon begin the 3 mile climb up to the 1750ft summit. 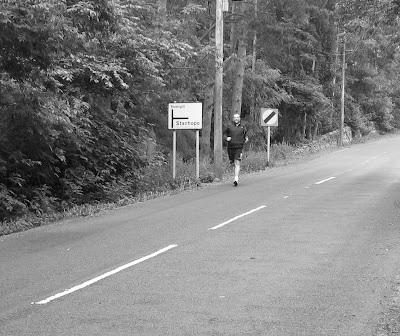 Ian Glasgow and Michael Dunn at the 26 mile point. Jim pausing for breath up Crawleyside Bank! I'm overjoyed to report that all 5 runners arrived safe and sound at Middleton-in-Teesdale this afternoon. Pictured at the start line from left to right is Carlton Fletcher, me, Mark Cass and John Brettell (support driver). Thank go to John and Mandy Baker for first class support. Thanks also go to the running team for a tremendous performance today. I'll post a full review when I've recovered but in the meantime it looks like we have raised around £900. This will hopefully get matched by the Northern Rock Foundation. Not bad for a 45 mile bike ride and 22 mile run in the Pennines. Well done team! 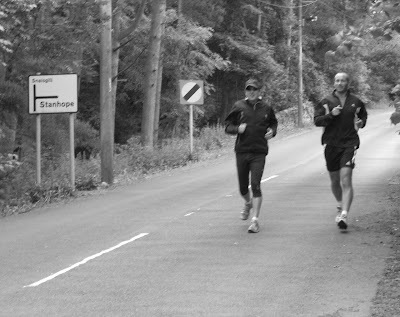 Two of the Pennine Challenge runners, Steven Moore and Jonathan Dixon, set off from Castleside at 08:00 this morning. They plan to run at a slower pace than the main group and with a 2 hour head start they should get to Middleton-in-Teesdale in plenty of time. Jonathan had quite a hefty back pack at the start. Amongst other things, he said it contained his comics, a catapult, some tuna sandwiches and a load of energy gels. They started off in bright sunshine with virtually no breeze at all. Let's hope the conditions stay like that. The main group of runners are due to set off at 10:00. I'll update the blog tonight, hopefully with tales of a safe and successful 22 mile run in the North Pennines. Below is the elevation profile (via my GPS watch) for yesterday's bike ride. Thankfully I just have to run half that distance tomorrow to complete this weekend's gruelling Pennine Challenge. Is it just me or are the 2 peaks on the profile looking a little too much like the Devil's horns? Very appropriate! Those climbs were evil! My recovery from yesterday's ride and preparation for tomorrow's run has involved lying on the settee watching numerous movies and finishing off last night's Madras! I'm absolutely shattered after yesterday. I can't wait for tomorrow! Heart, courage and power in the Pennines. It was mission accomplished today as The Coach, Dunny, Patto (not pictured) and myself completed the 44 mile (or as it turns out the 45 thanks to the detour around Stanhope Ford) route from Castleside to Middleton-in-Teesdale and back. I even managed to cycle home 4 miles from the finish line and I'm typing this blog entry with a well deserved King Prawn Madras on the way! I'll post a full match report tomorrow. In the meantime, I must say I was impressed with the lads on what was an extremely difficult day in the saddle. The wind on the outward bound journey added a little something to the overall difficulty. That Ian Glasgow has got the peddling power of a small power station and Dunny has the courage and heart of a lion. Patto, meanwhile, was on a mission as he was "treating" his missus with a visit to the 20/20 cricket tonight and had to be back way before the rest of the team. That's all for now! The Madras is here! Now it's a real challenge! All of a sudden the Pennine Challenge has become a real tougher challenge. I'm now more nervous than I was at the start of last year's big run! Allow me to explain. The cycle element of the team are now doing the route today (Friday), 2 days earlier than the runners (Sunday). It's something to do with stag do's and golf rounds! Unfortunately, Fraser Scott has had to drop out due to a chest infection. This is an ideal opportunity for me to step into the breach and keep the cyclists numbers up. I'll also still be taking part in Sunday's run making this weekend's Pennine Challenge doubly difficult (and well worthy of sponsorship!). At least I'll be in esteemed company. 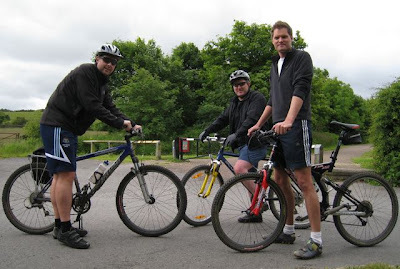 The other cyclists are Ian "The Coach" Glasgow, Jim "Patto" Patterson and Michael "Dunny" Dunn. They are all used to spending a long time in the saddle over different terrains and in different weathers. Michael has defied the odds by joining the team after only having knee surgery 6 weeks ago! 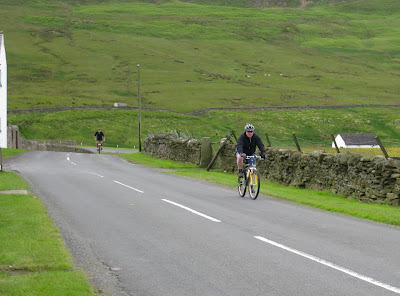 This surgery was as a result of a serious injury sustained on last year's Pennine Challenge. I've used the words "hero" and "Michael Dunn" many times over the last 12 months. We will be starting at Castleside on the C2C route at 10:00, making our way to Middleton-in-Teesdale and then back to Castleside. All in all, it's a nice hilly 44 mile round trip. Cycling is not my normal thing but with over 60 Spinning classes since February and 187 miles cycled in the last 3 weeks I'm quite well prepared. Pictured above is the 11 mile point on the ride. 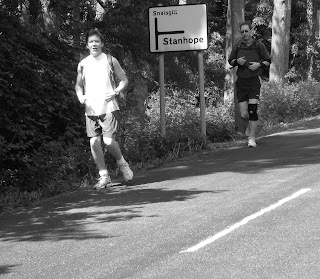 This is the climb out of Stanhope. It's a nightmare. Expect an update at teatime today on how it all went. Why am I doing all of this again? Sometimes I need reminding why I'm training 2-3 times a day most days of the week with the prospect of it getting even more difficult over the next 3 years. Tonight I read a selection of the hundreds of emails I received during last year's big run. I had a lump in my throat and a tear in my eye as I scanned through them. The majority of emails are from people I'm never likely to meet. They are all inspiring and encouraging. It'll not be the last time I browse through them as I look, every now and again, for a reminder that all of this effort is worthwhile. Meanwhile, training this week is going exceptionally well. It's probably the hardest week of training for 12 months with 51 miles on the bike, 10 miles of running and 2 gym classes in the last 3 days. Tomorrow will be a test with 34 miles on the bike and 5 miles at lunchtime. Friday will see me do a 2 spinning classes in the gym and a long bike ride on Saturday will round things off nicely. I'm looking forward(!) to next week where the majority of days will be spent running. 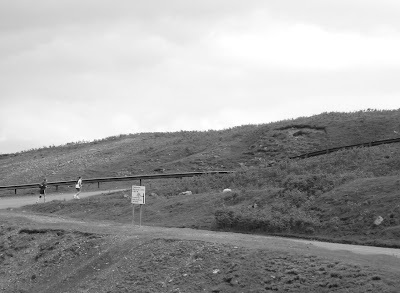 Oh and it's the 22 mile Pennine Challenge run a week on Sunday! If you would like to sponsor me and the rest of the team, please follow the link to justgiving.com at the right hand side of the page. Thanks in advance for the support! 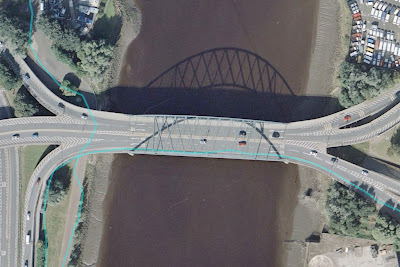 Pictured (courtesy of my GPS watch and Google Earth) is my route over the Scotswood Bridge for last Monday's Blaydon Race. More on that later, but I'd like to mention how things are going on the training front. 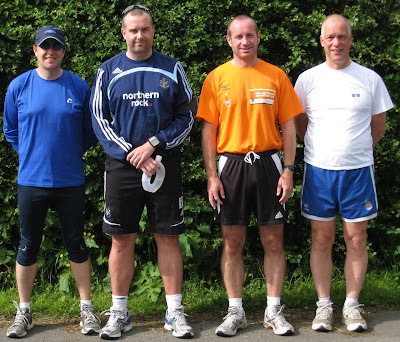 Training in 2008 has evolved into a nicely balanced mix of gym classes, running and cycling. It's a far cry from the 50 miles a week I was running last year in preparation for the big run but I actually feel fitter and definitely have more strength and far greater mobility. At the start of the year, I had planned on just doing the usual lunchtime runs and longer runs in the Pennines on weekends. It hasn't worked out this way as I'm enjoying the other elements of training so much. What has gone to plan, however, is the requirement to run faster and make things tougher than last year. Almost every run is at a quicker pace than last year. Also, the strategy I've adopted in preparation for USA 2011 is "no rest, no recovery". I've got 3 years to get used to running myself into the ground and I've made a pleasing start on that front. It's taken almost 5 months to establish the current training schedule. I'm now ready to step things up a notch in an attempt to see just how far I can push myself and, more importantly, to try and be as well prepared as I can be to start USA 2011 training next Spring. I see the remainder of the year being split into 6 cycles. Each cycle will consist of 4 weeks of cross training. Week 1 will be 60% cycling, 20% gym, 20% running. Week 2 will be 60% running, 20% gym, 20% cycling. Week 3 will be 60% gym, 20% cycling, 20% running. Week 4 will be 80% running, 20% gym. So that's the remainder of the year sorted out! Meanwhile, back to this week, where Monday saw me run my 3rd Blaydon Race. It was a good run for me and I managed a PB of 51:32 despite the course being lengthened this year. The fact that I'd had a spinning class (taken by Tracy (aka The Terminator!)) at lunchtime makes it all the more pleasing. Remember - No rest, no recovery! By some coincidence, I saw Tracy in my eyeline just before the 1st mile point on the Blaydon Race. She's recovering from a knee operation and was taking it easy. I managed to keep up with her until the final 1/4 mile and it really helped having a familiar face as a pace maker. 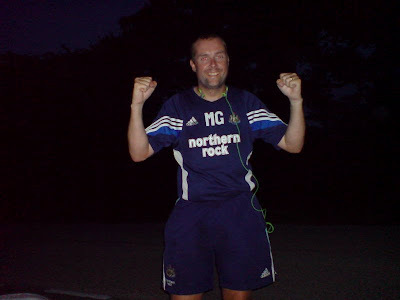 I was over the moon with my final time when I got to the finish line in Blaydon. Katy treated me to a pizza on the way home and I was up again at 06:00 the next morning for my maiden voyage to work on my bike. Getting to work in 01:35:55 felt like an even bigger achievement than the Blaydon Race PB. Cycling home on Wednesday night in the rain and then back again on Thursday morning surpassed everything else. I should explain that each pound saved cycling (and given the economy of my car that is some saving!) is going towards what I'm calling the "2011 War Chest". This is the sum of my own money that I'll need to support the next big tour. I'll talk more on that in the coming weeks. Meanwhile, let's not get too confident and brings things back down to earth! Wednesday's bike journey home was not without incident! I stopped at mile 16 for a drink. Nothing too dangerous there you might think. Think again as I, for one moment, thought I was on a spinning bike in the gym and forgot to release my feet for the stirrups. Well you can imagine the result! TIMBEEERRRRRR!!!!!! Thankfully, all I had to show for my stupidity was a grazed knee and bruised hip. Oh and my pride took a bit of a dent too! A PB in the Blaydon heat. 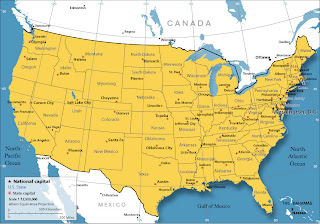 Route planning for USA 2011 made 100% easier! The planning for USA 2011 just got a whole lot easier! I must say huge thanks to Jackson Williams and his team for providing me with a detailed route from CA to NY. "Jackson, from Norwich, says he hopes to complete the challenge in between nine and 14 days. “Initially, I hoped to try and break the world record, which currently stands at nine days and two hours,” he explains. “But, although the training preparations have been going well I haven’t covered as many miles as I would have liked to. 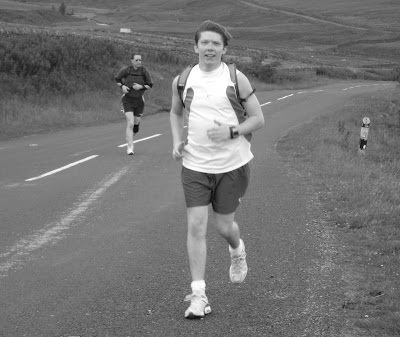 “In preparation I’ve been running about 100 miles a week, with six days on and one day off. During my challenge, if I run 96 miles a day, I’ll break the world record and if I run 60 miles a day, I’ll complete the challenge in 14 days. But I’m just going to take the challenge one day at a time, and see how it goes.”". With such a detailed plan I feel like I've been given many months head start in the planning and preparation for the next big run. The next major tasks are familiarising myself with the route and trying to secure some mobile accommodation. Getting some cheap/free digs is the key to the success of the next big run. Once I've secured a camper van (or similar) I'll be putting the chances of success up from 5% to 50% straight away. In the meantime, thanks again to Jackson and his team for some invaluable route plans. 4 weeks until the next challenge. It is now just 4 weeks until the Pennine Challenge. I feel in good condition and really ready for the 22 miles of relentless climbs and steep descents. The rest of the team seem in good nick too, if not a little nervous. Speaking of the team, we have added 2 members to the squad. Jim Patterson, who cycled the route last year, will be a runner this time around. 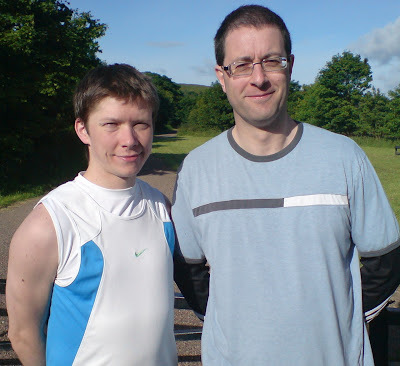 Mark Cass, who is a good runner and all round athlete, will also be joining the running element of the team. 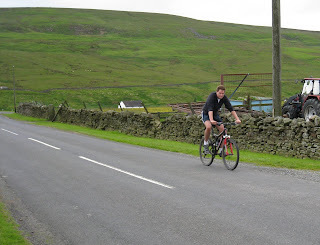 I'd like to express my thanks to the bbc.co.uk/tyne website for a nice article on the Pennine Challenge. It can be viewed here.